Bath is surely one of the most gorgeous places in England. With its stately Georgian architecture, wide walkable streets, and its lush green surroundings, it’s easy to fall into a reverie while wandering through. But it’s more than just a pretty face. With over two-thousand years of history, it’s also one of England’s oldest continuous towns. Here are the Bath must-sees. If you’re in London, take the 2 hour train ride from Paddington Station. Situated on the line that goes all the way to neighbouring Bristol, train services are fast, frequent, and often reasonably priced. 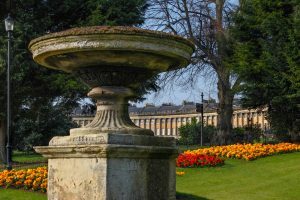 Like London, Bath has a rich Roman history. The Romans saw great spiritual significance in the warm waters running underneath the land. They built a massive spa—their largest complex in England—to capture and capitalise on it. Today it’s the best-preserved Roman ruins in the country, with a stunning main bathing hall that makes imagining Roman life easy. The heavy crowds don’t detract from the dark, mystical atmosphere. Bathing in Bath, you say? After studying how the Romans swam, take a soak to more modern comforts. The Thermae Bath has been in use since the 1500s but—don’t worry— went through a swanky face lift in 2006. It now includes two swimming pools, massage jets, and a health and wellness suite. Who knew history was this therapeutic? 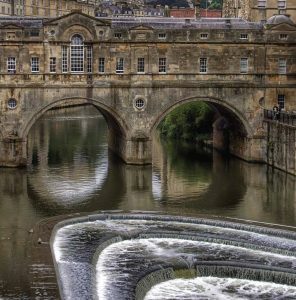 When Bath was the hippest place in England in the 1700s, party and retreat spot for nobles and nouveau riche alike, the most innovative architecture of its time was being built there. Now, you can see the places that defined the style of (what we now call) Georgian. The sweeping Royal Crescent is the must-see. To get a look and feel inside one of them, go to the Number 1 House Museum. It recreates what life was actually like for the inhabitants of the crescent, from the lowest servant to the lord and master. Possibly Britain’s most beloved author, Jane Austen made Bath her home for a significant period of her life. The city is alive with those literary connections—go in September and witness hundreds come dressed-up Georgian for the Jan Austen Fair. For the rest of the year, the Jane Austen Centre is the best way to get an idea about Austen’s life and times. They do historical re-enactments and share some of the secrets in her novels. Bath is a city best explored on foot. Fully aware of this, the city council offer a daily free walking tour of the city. They meet at 10:30 AM and 2 PM in front of the Bath Cathedral. Though free, these guides are well-trained and completely in love with their city—so expect a walk that’s both detailed and enjoyable. That covers the absolute Bath must sees, though there are many other museums and sights you can visit during your stay. 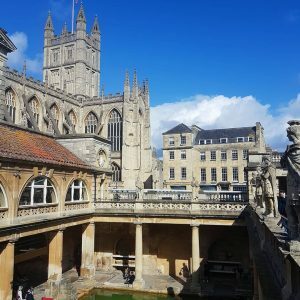 In this special town with its rich history, it’s easiest just to wander – to drift down the streets, and imagine what it was like for Austen and company when Bath was the hippest place in all of Britain. If you’re travelling around northern England, don’t miss out on York – and check out our guide for it too!